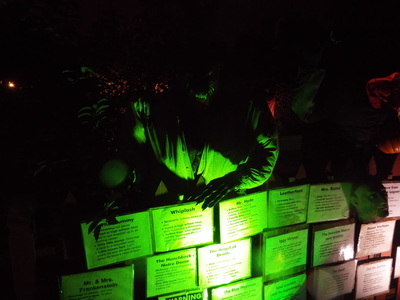 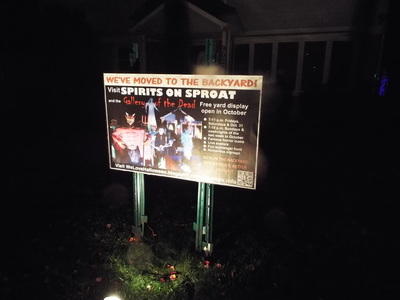 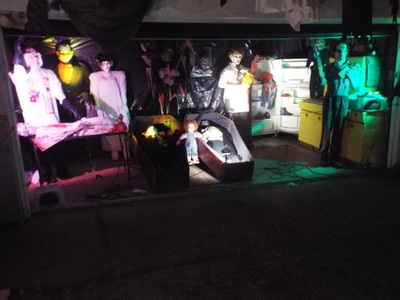 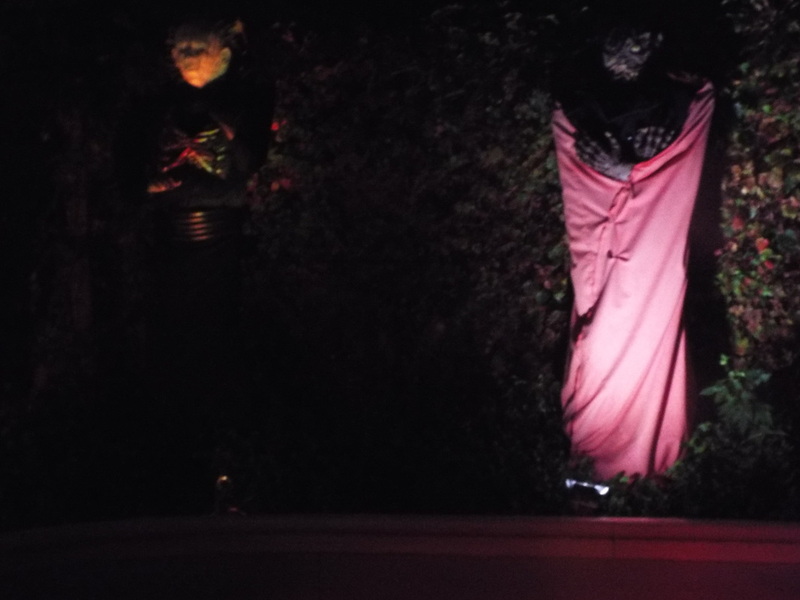 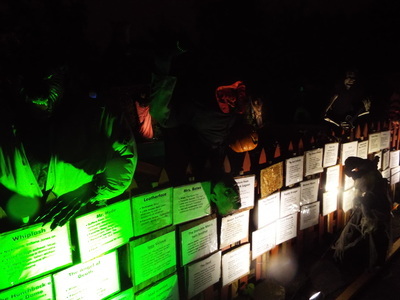 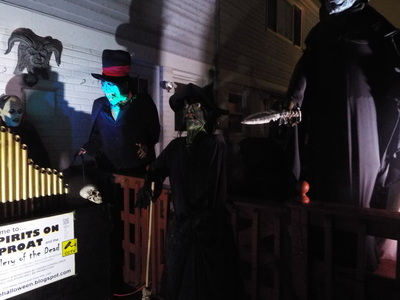 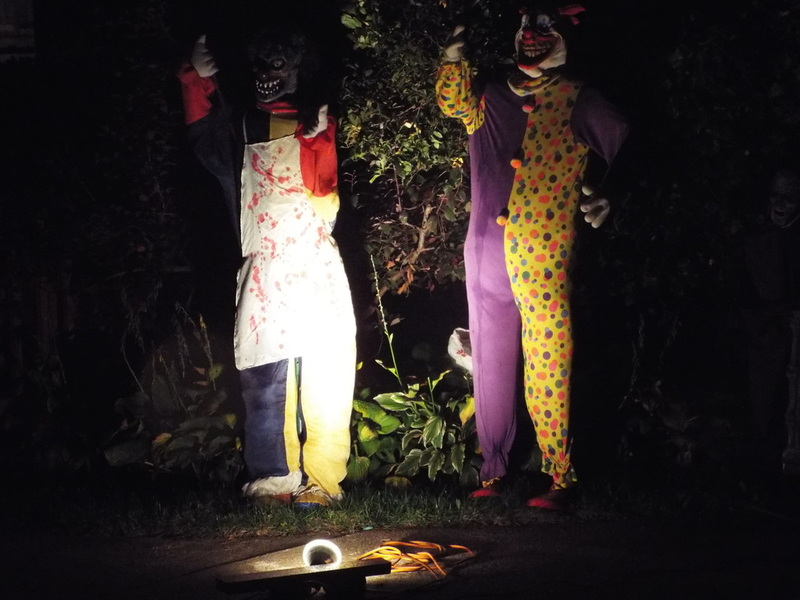 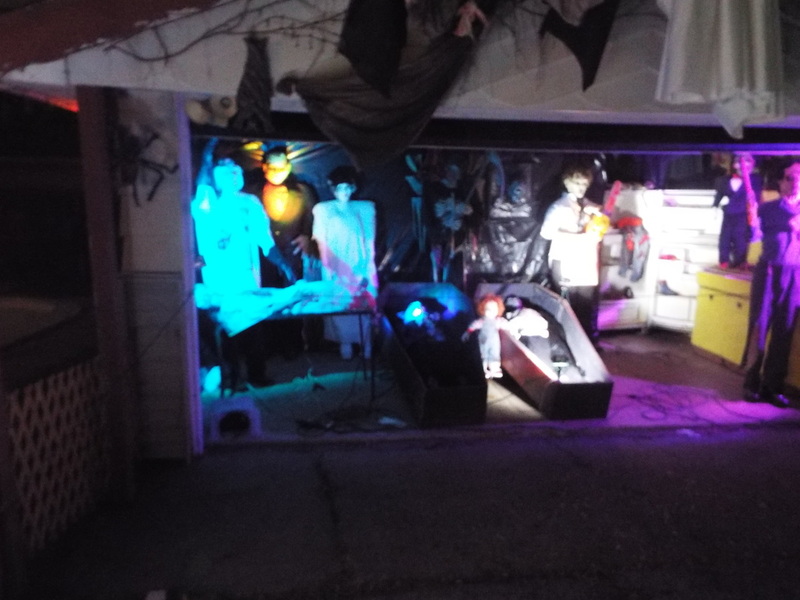 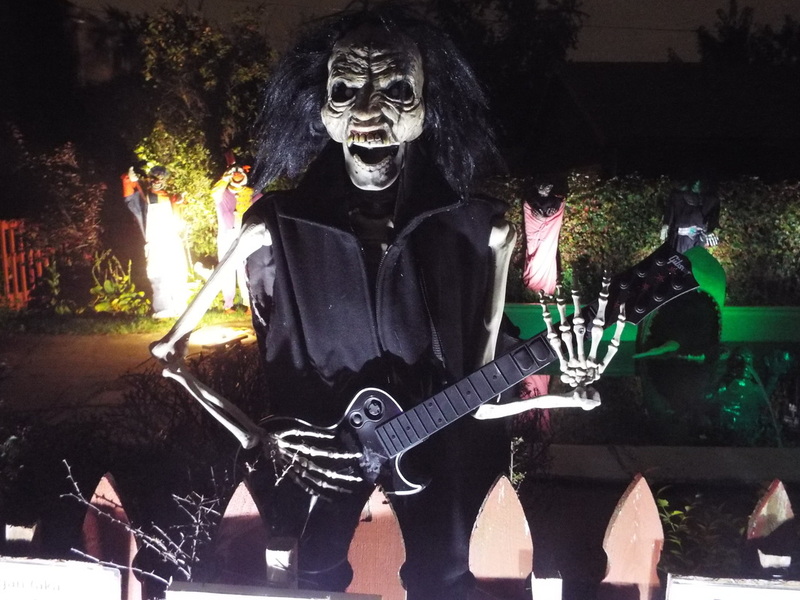 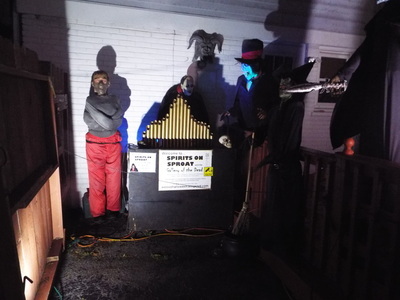 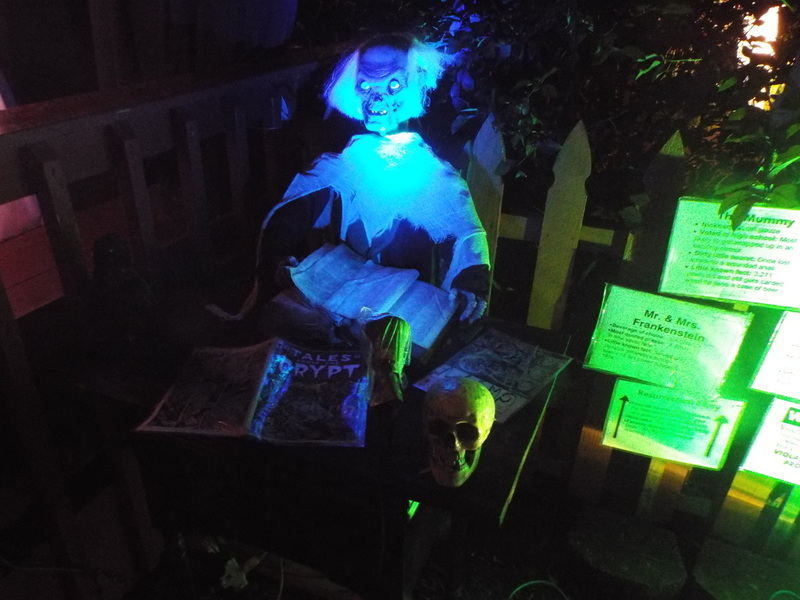 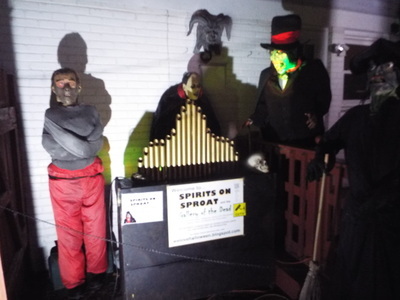 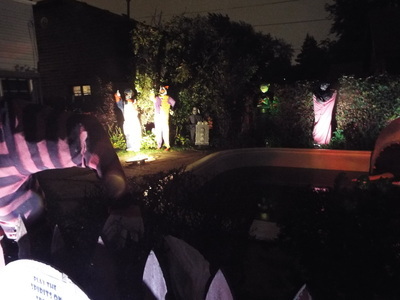 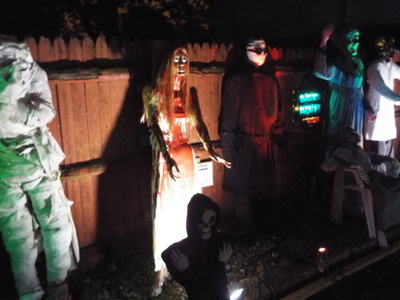 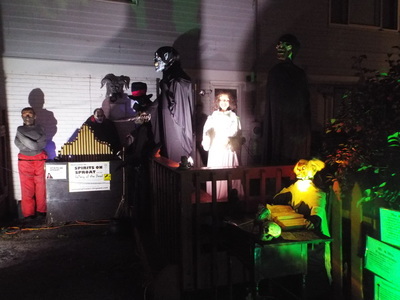 This year marks the 10th anniversary of one of our favorite yard displays - Spirits on Sproat. 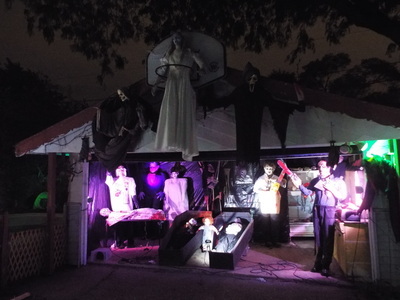 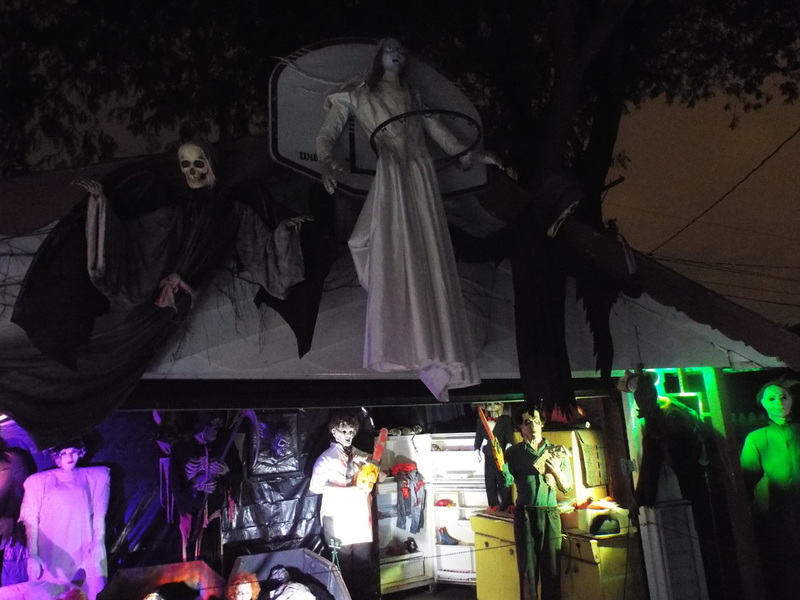 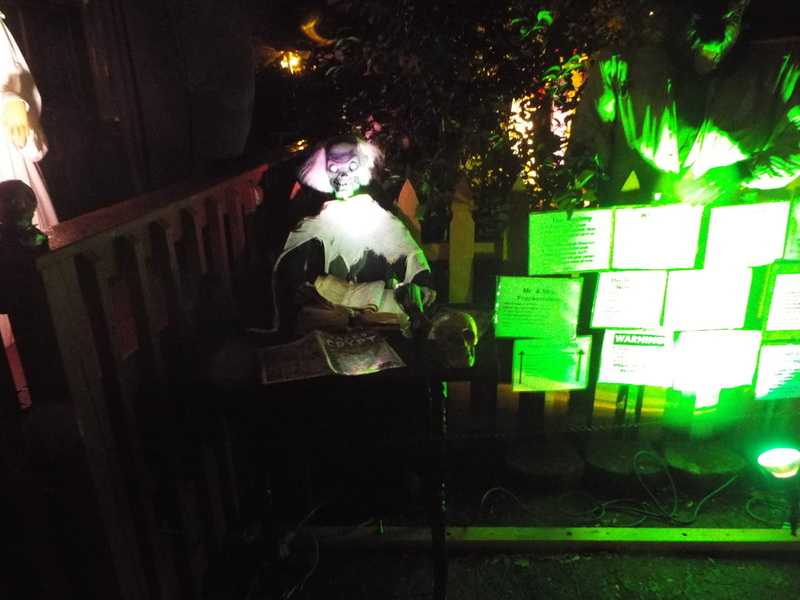 Like many haunts we visit, this is one that has gown over the years to include more and more props and figures. In fact, this year the display has expanded to the point that it has moved from the front yard to the back yard, giving it more room to grow. 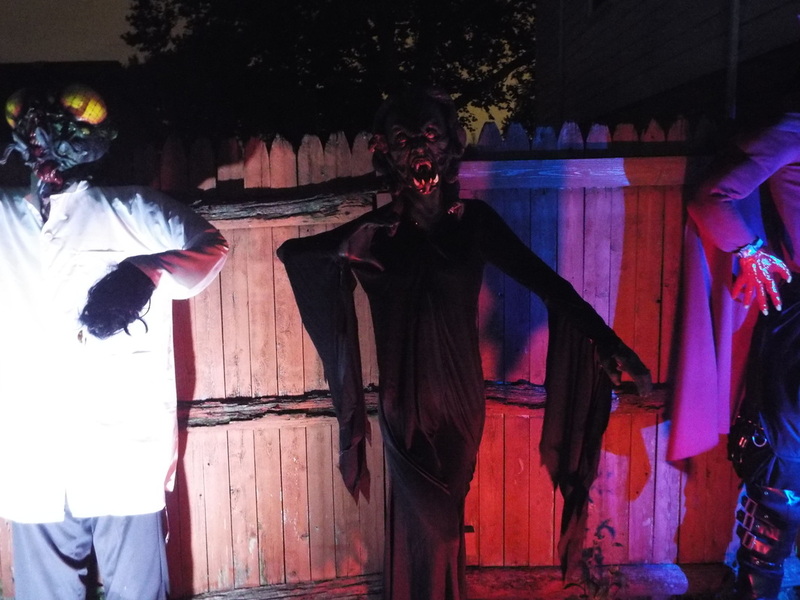 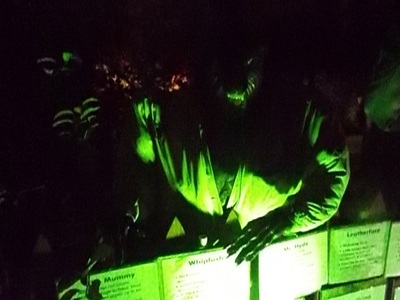 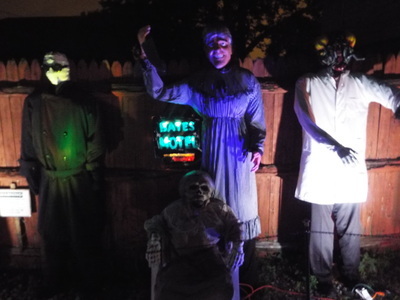 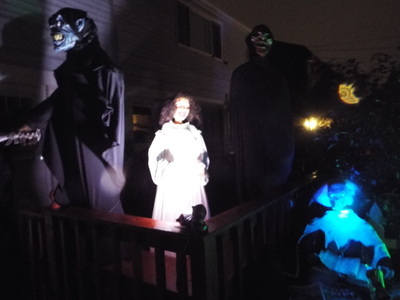 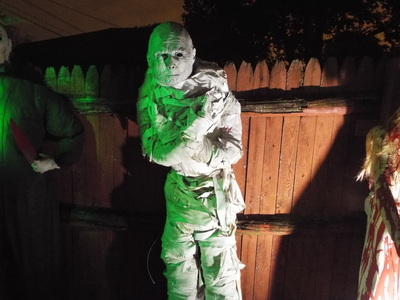 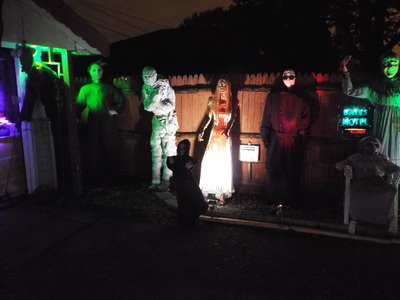 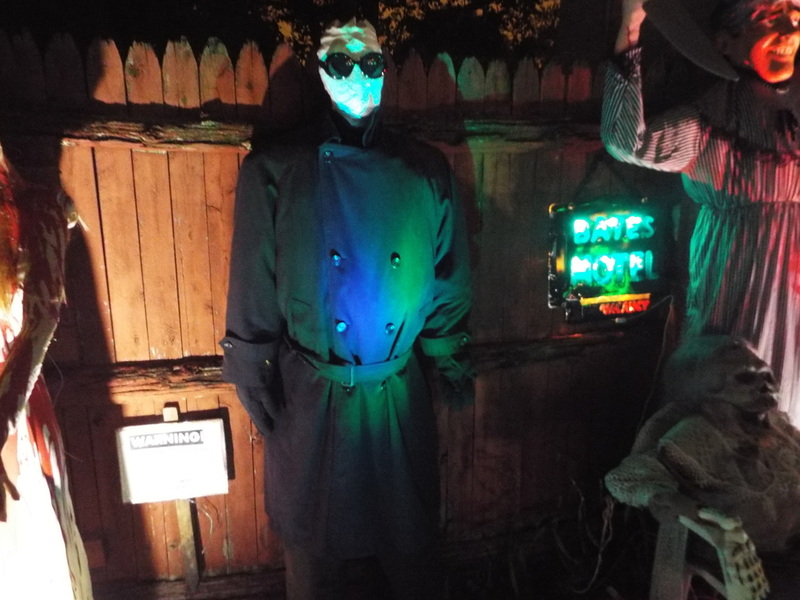 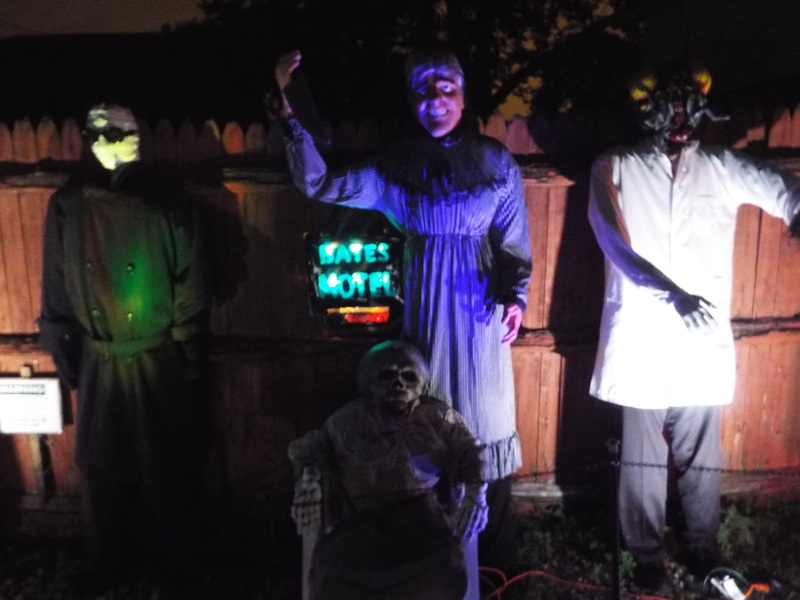 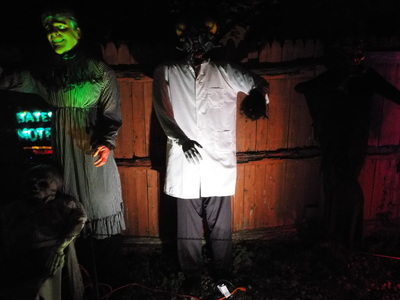 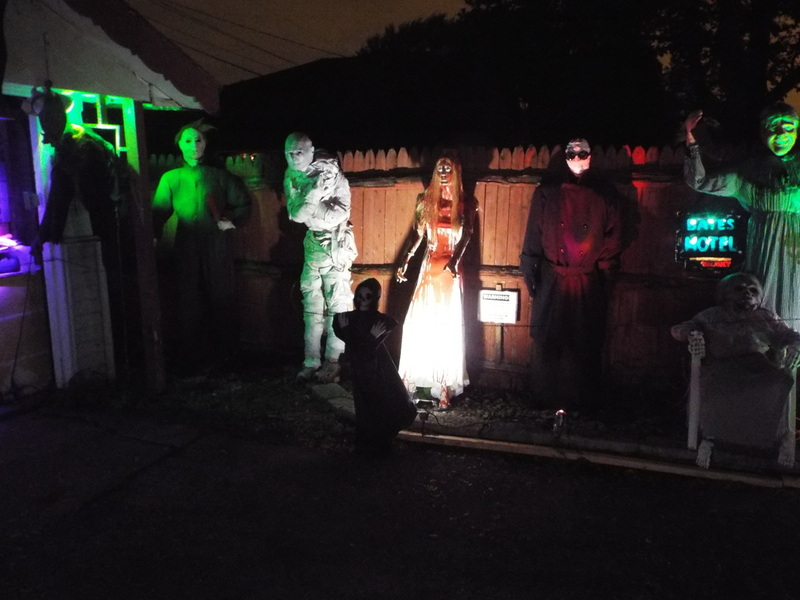 Unlike other displays, which are often amalgamations of various types of props (tombstones, life size figures, etc), Spirits on Sproat focuses solely on life size horror figures, from local legends like Resurrection Mary to famous movie monsters like Frankenstein, to their own creations. 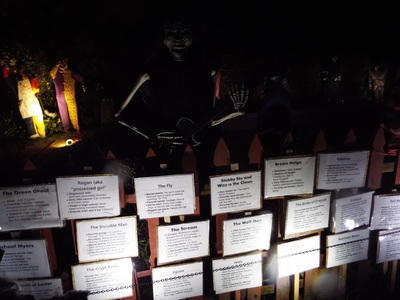 Each figure is given its own area of display, and each one has a placard identifying it and giving some information about it (most of it tongue in cheek). The number of figures is impressive and includes favorites for horror fans of all ages. 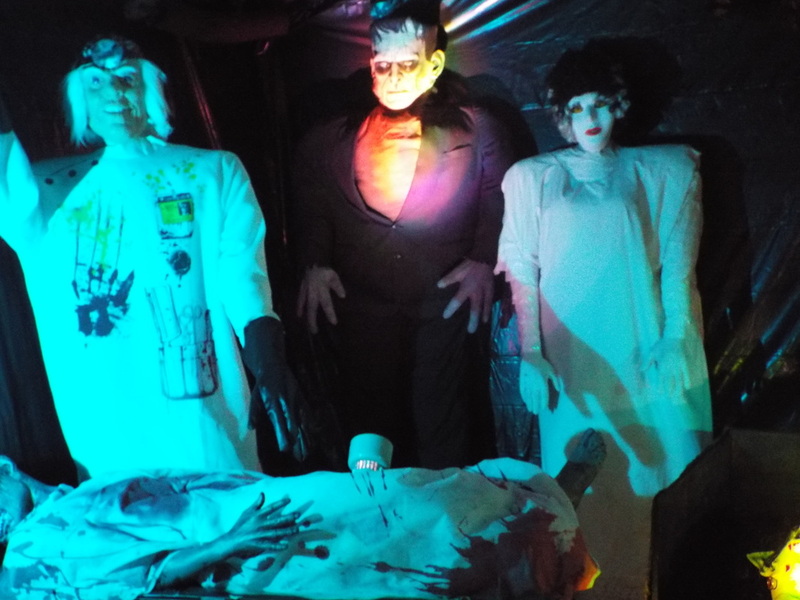 For classic Universal horror movie afficionados there are figures such as the aforementioned Frankenstein's monster, his bride, the wolf man, the hunchback of Notre Dame, and the mummy. 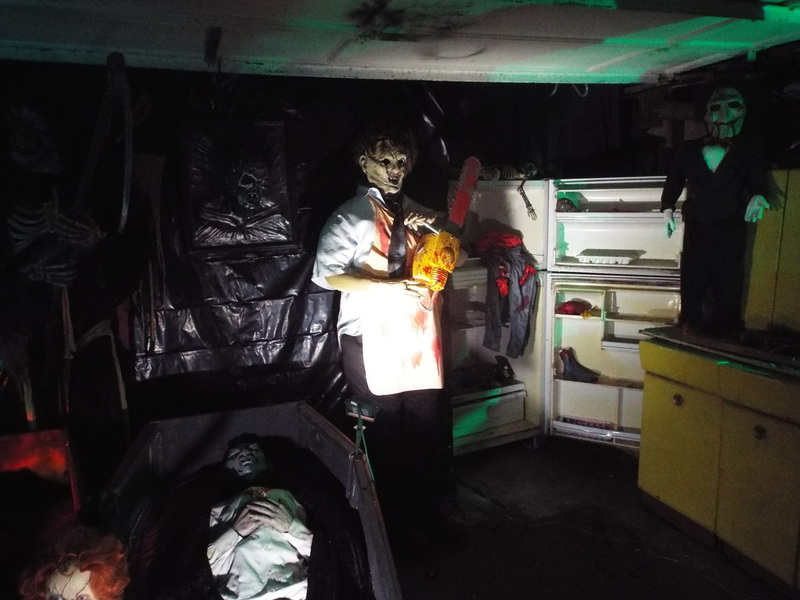 For fans of 70's and 80's horror there are figures of Carrie, Freddy Krueger, Jason Voorhees, and Mike Myers (amongst others), and many other abound. 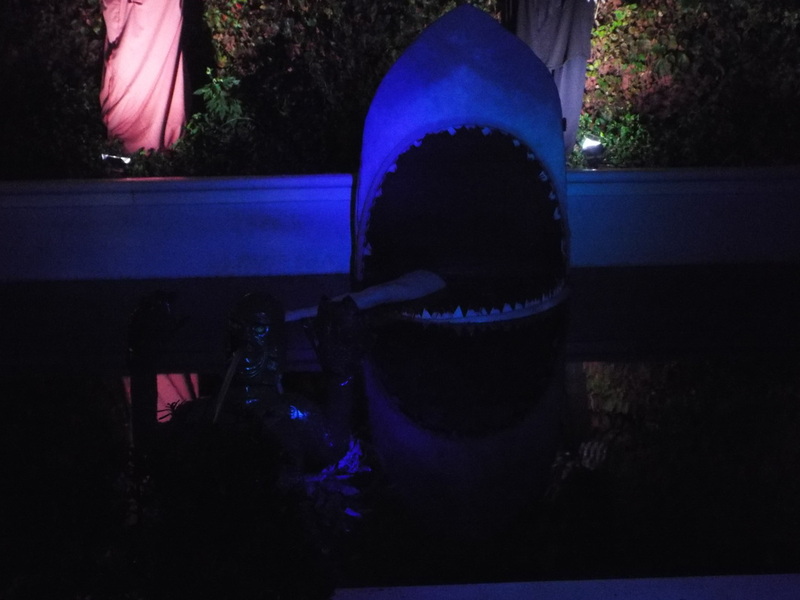 This year there is even a giant Jaws and Creature from the Black Lagoon in the pool! 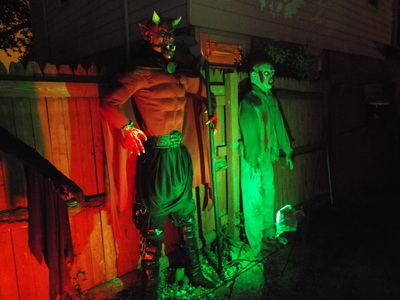 The move to the backyard gives visitors an opportunity to study many of the figures up close, which was not really possible in the front, and also allows for the garage to be set up as a staging area, which this year featured many figures, including a brand new figure of the evil Ash from Evil Dead. Not only is Spirits on Sproat visually appealing, its' fun for the whole family. 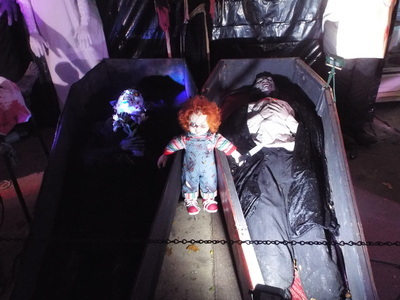 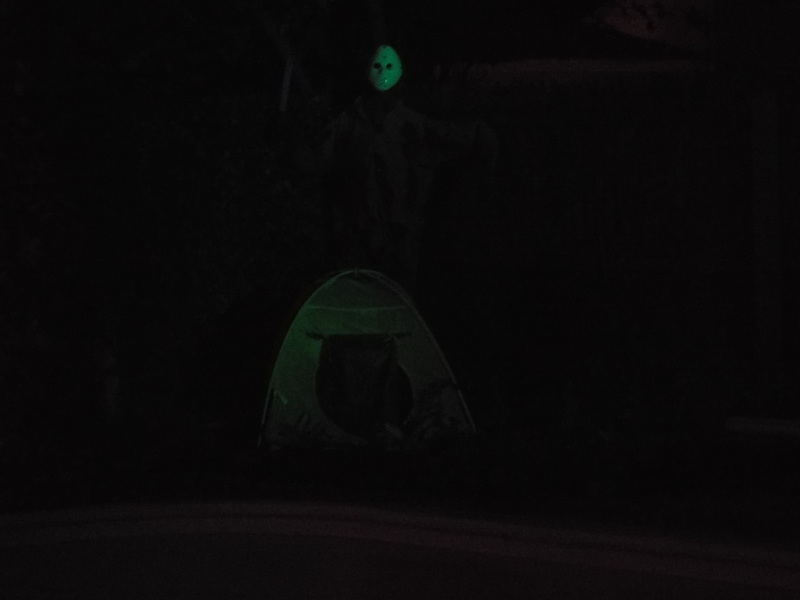 There are two games people can play simply by using their smartphones, which help people learn more about the figures there, and the scare factor on most night is pretty low, so there's no need to worry about freaking out the little kids. 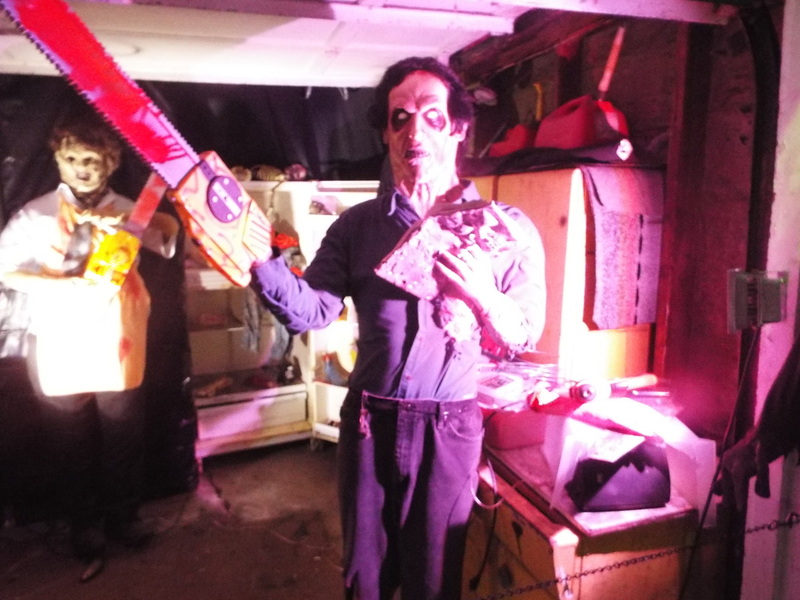 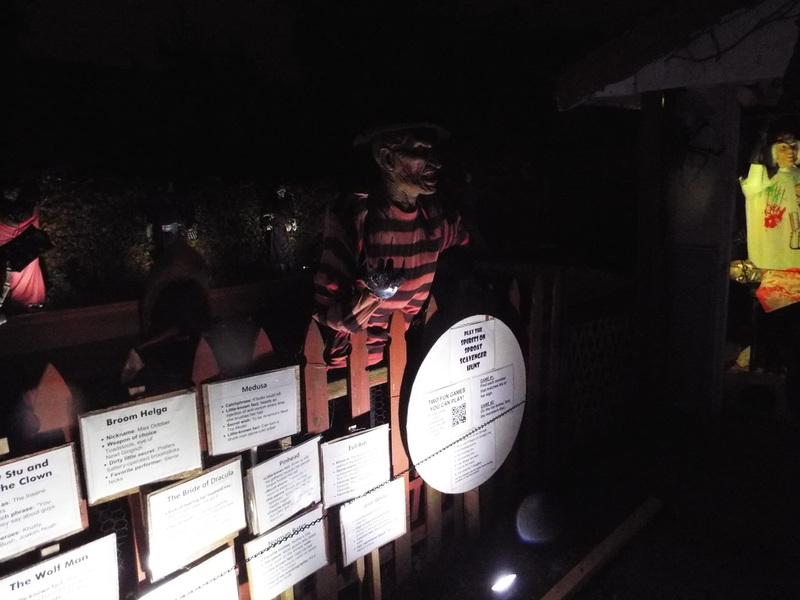 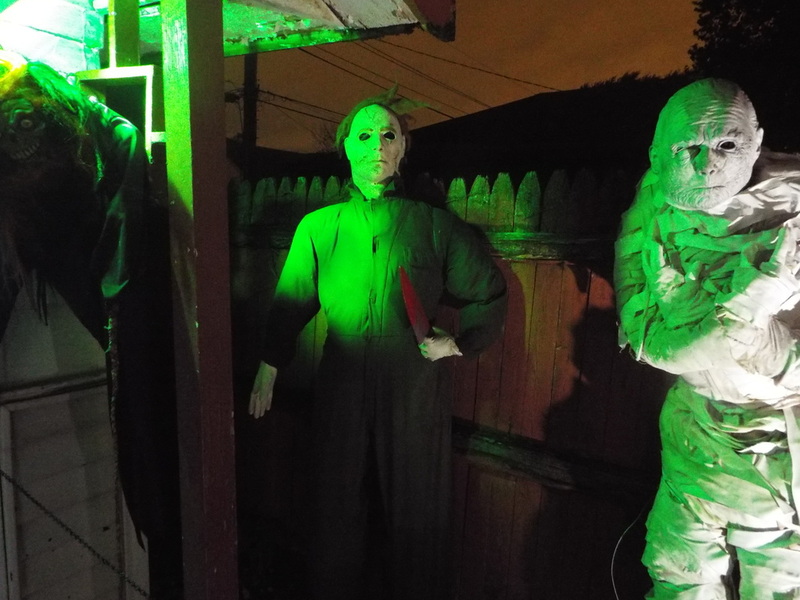 Of course, on certain evenings live actors prowl around the display, including a great Mike Myers, so if you happen to go when live actors are around, just keep an eye out, as they have a habit of sneaking up on you! Overall, this is a most enjoyable setup, particularly if you go on a cool, crisp fall evening and take the time to really look at all of the figures there. 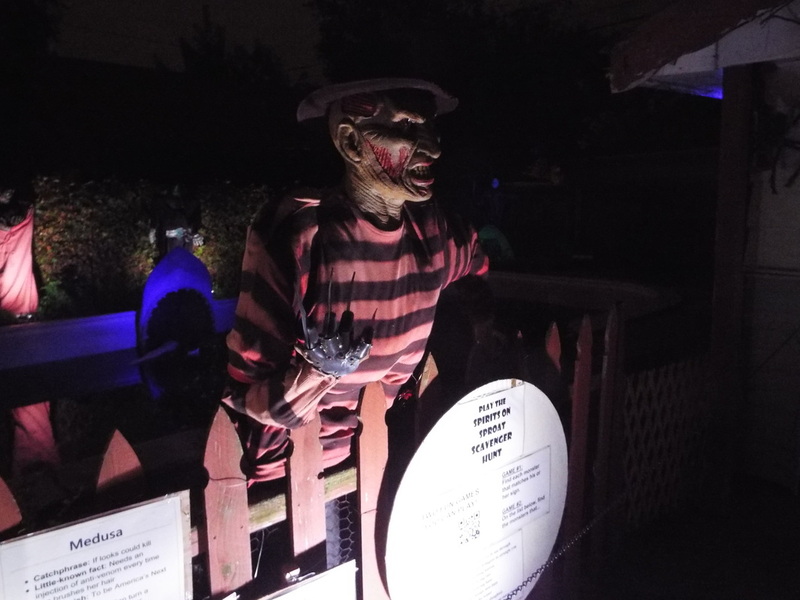 They are very detailed, and the lighting makes some of them seem quite alive, upping the creepiness factor (and the fun factor, too). 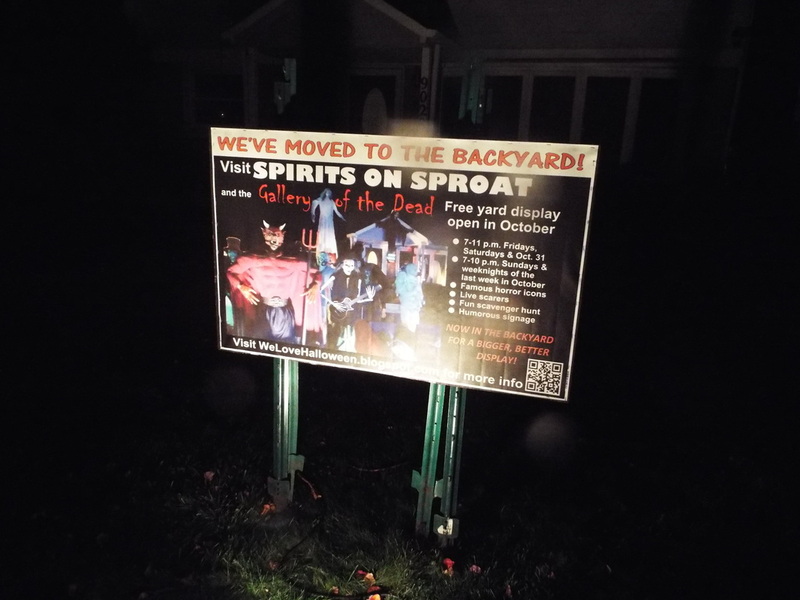 Congratulations to Spirits on Sproat for reaching its 10th year of operation, and here's wishing many more years to come!